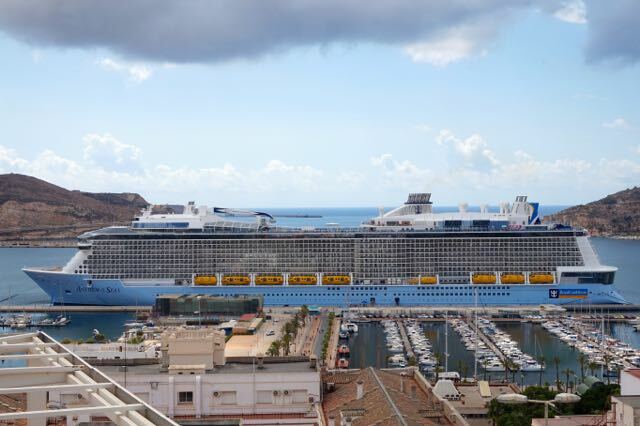 Anthem of the Seas is the third largest cruise ship in the world and after months of sailing in the Pacific and Mediterranean, the ship has finally arrived in the Atlantic. As I approach the docks, my complete attention draws towards a majestic 18-story building. It is longer than seven Boeing jetliners and there’s a giant glass capsule jetting out of its top. Anthem of the Seas by Royal Caribbean is the biggest ship I have ever seen and most spectators at the port feel the same. Along with 4,179 other passengers, I walk into this floating island with pure astonishment. In the next two weeks, I was about to experience over thirty dining establishments, nightly entertainment in four venues, adventures like skydiving at sea, my first Robotic bar, and nine amazing ports of call across five countries. From where I sit, this is the best cruise in the world. With each passing year, the cruising industry is getting more innovative with high tech infrastructure, modern architecture, and upscale culinary experiences. For this winter, Anthem of the Seas promises the best travel experience in cruising to those looking for luxury at affordable prices. Here’s my review of Anthem of the Seas. The interior of Anthem of the Seas is modern and elegant, reminding me of some of the classy hotels you would see in Las Vegas. Intricate flooring and ceiling work are specifically chosen to set a different tone on each floor, so you can feel the change in ambiance going from one part of the ship to the other. With 2,090 staterooms Anthem has more guest accommodations than the tallest hotel in the world. It also has more balcony rooms than any other cruise ship. The most fascinating accommodations are the spacious two-story lofts and three-bedroom family suites that come with a living/dining room, a TV room, a balcony Jacuzzi, and panoramic views. Say goodbye to claustrophobia! If you are used to the one or two dining options presented on most cruise ships, be blown away by the culinary selection here. On the Anthem, there are 18 restaurant concepts to choose from. Themed restaurants include Japanese, Italian, French, Asian Pacific, American, British pub, cafe, buffet, and much more. Each one has a unique ambiance and creative cocktail menu. While just the design of the restaurants is worth checking out, the food is comparable to any upscale restaurant on land. Where else can you taste creations by world-renowned chefs such as Jamie Oliver, Michael Schwartz, and Devin Alexander on a floating island! Furthermore, you are not restricted to sitting at round banquet tables along with other guests you don’t know. Couples can easily have a date night while families can reserve larger tables for privacy. Did I mention that a server is assigned to you for the entire cruise, who travels with you from restaurant to restaurant? The activities on the Anthem accommodate not only families but adventurers as well. Choose more relaxed bingo, guess the tunes, or jeopardy game time, but then you can also go skydiving with RipCord by iFLY, go-carting, rock climbing, and skating at SeaPlex, surfing at FlowRider, and be lifted 300 feet above sea level in a pod on the iconic North Star. Sure, most cruise ships have a little gym and nice spa services, but on the Anthem, they take physical health seriously. There are fitness classes – yoga, stretch, Pilates, spin, even a boot camp, for those who want to stay healthy. You can get a personal instructor who will train with you, a nutritionist to consult with, and can select from several anti-aging solutions. Anthem of the Seas offers an extraordinary lineup of multidimensional entertainment in state-of-the-art venues with mind-blowing technology. 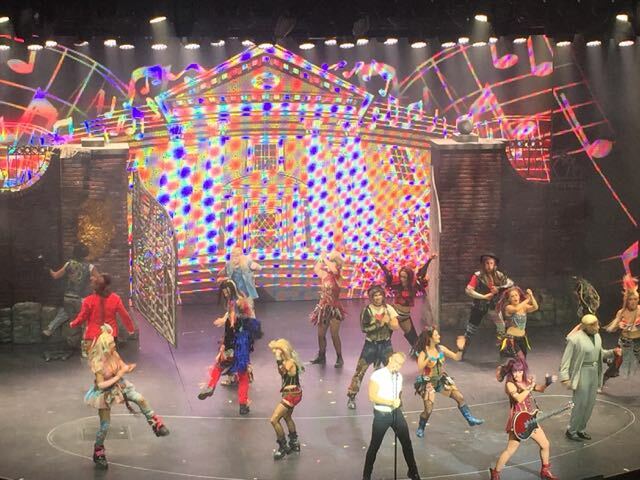 Shows such as Spectra’s Cabaret, We Will Rock You, and The Gift are huge hits, while international artists from around the world fly in to perform live music throughout the cruise. On no other cruise will you find two entire floors dedicated to teens and kids. SeaPlex is the largest indoor active space onboard offering tons of activities to stay active, from basketball and ping pong tournaments during the day, to a floating DJ booth at night. Kids’ favorite characters from Shrek, Madagascar, and Kung Fu Panda entertain the young ones. There is also a state-of-the-art video arcade and 3D movie room, and a Johnny Rockets diner for when hunger strikes. The daily cruise planner delivered to the stateroom lists all the activities happening throughout the ship. There are lunches for singles travelers and mixers for the LGBT community, offering a chance to make new friends onboard. Anthem of the Seas sails around the world, and is now making its course around The Bahamas, Jamaica, Haiti, Grand Cayman, Mexico, Honduras, Puerto Rico, St. Kitts, Barbados, Martinique, and St. Maarten, offering guests the opportunity to truly immerse themselves in the destinations they visit. Rough estimates by fitness instructors show that most cruisers gain an average of 1-2 pounds a day. If this statement scares you from taking your next cruise vacation, read this article first. On my recent 2-weeks cruise aboard Royal Caribbean’s Anthem of The Seas, I interviewed Maurice Van Rijthoven, a 30-year old fitness instructor from Netherlands. He oversees the VitalitySM Spa and Fitness center, the largest floating fitness area ever built. This 6,000 passenger vessel also boasts 30 restaurants and bars. Clearly, this is not your destination for weight-loss, but its possible. 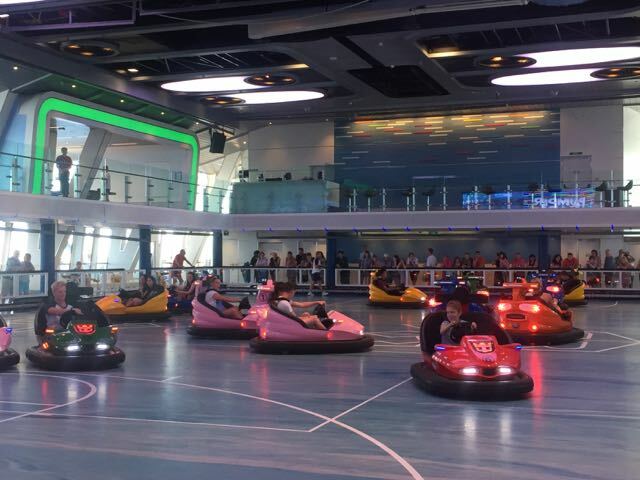 Located at the middle of deck 15, the SeaPlex is a large indoor gym with a full-size basketball court that can be converted into a dance floor, a flying trapeze school, a roller-skating arena, that converts to a bumper cars playground. The “SeaPlex” also features the SeaPlex Dog House food truck and table tennis, air hockey and foosball tables on a second-level mezzanine. The Spa and Fitness Center are located on decks 15 and 16, offering beautiful views of the surrounding seas. On embarkation day, Rijthoven gives a tour of the gym and spa. This is the best time to sign up for classes as they tend to fill up. Daily class offerings start at 7am and include yoga, pilates, stretching, spinning, body sculpt and more. The spin class emulates a Tour de France type of challenge for the 16 bikers participating. Some of the classes require a fee to attend. For those who like to freestyle it, the gym is well stocked with TechnoGym equipment, and includes practically everything one may need for a total body workout, including cardio, weights and a stretching area. The outdoor jogging track is 1/3 of a mile, with an uphill feature, and a great way to get your daily run. But you need to go early morning or late in the evening, as it gets crowded with sunbathers during the day. There is also a bootcamp you can sign up for if you need a little group motivation. Generally, 8-10 guests participate in a daily regiment with a personal trainer that keeps them in shape. Rijthoven tells me that on an average, 20-30 people sign up for one on one personal training sessions during the cruise. Roughly 10% of cruisers use the gym facilities, which is tragic for Rijthoven to witness as he overlooks some of the finest equipment on sea. “The biggest mistake people make is overindulging,” he says. Vacationers think its ok to eat and drink whatever they like, because they are on holiday. They wouldn’t ordinarily pack in these many calories in their normal diet. Rijthoven offers workshops throughout the trip educating travelers on how to properly balance having fun and keeping fit. A personal consultation – Eat more to weight less measure your metabolism rate and advises a diet plan accordingly. For those who want to make a drastic change in their physical wellbeing, he advises a Detox program that travelers can do once they get back. This helps them remove toxins from within the body, and allow it to better absorb nutrients. One of the ship’s restaurants, Devinly Decadence at Solarium Bistro offers spa cuisine created by author of The Biggest Loser Cookbook series, Devin Alexander. The menu boasts dishes that are under 500 calories for breakfast, lunch and dinner. There is a wide selection of salads, sandwiches, seafood, pasta, as well as dessert. For those who forget to check in with the fitness regime regularly, you may get messages delivered to your door or your tv screen reminding you about the special classes being offered each day. Rijthoven advises that if all cruisers found it in their schedule to exercise one hour daily, whether it is running, attending a class, or training on your own, they won’t end up gaining weight from their vacation. Skydive – Afraid of heights? Kids and adults can experience what it feels like to fly, within the confined wind capsule on board. RipCord by iFly® has introduced a groundbreaking simulator that gives a free fall skydive experience for an entire minute. The trainers show you proper posture for flying and also guide you through your flight. Lift off – As we approach each port, the first thing locals notice is this giant capsule lifting off from the top deck of the ship. North Star is like a London eye that takes 14 passengers at a time, ascending gently 300 feet above sea level, and giving breathtaking 360° views. There are high power binoculars available inside the capsule so you see the surrounding areas. This is really fun while departing a port, so you can get a great view of the city. Rock Climb – On the Anthem, there is a 30 foot high rock climbing wall where beginners can practice along the colored coded rocks, and advanced climbers can create their own pathways. Surf – Taking surfing lessons right onboard with FlowRider®, a 40-foot-long surf simulator located at the back of the ship. You don’t have to worry about high tides or jelly fish here. Sports and more – The SeaPlex on deck 15 is the largest indoor active space at sea. Here’s where you will find most kids and teens playing video games, table tennis, and munching on hot dogs. Even adults join in the fun enrolling in circus school, basketball and cricket tournaments, roller skating and bumping cars. All of the adventures are free for the cruisers on board Anthem of the Seas, although some may require advance reservations. My first cruise travel experience was about 10 years ago. I took a 4 nights/ 5 days cruise from Tampa to Cozumel, Mexico. Although it was a relaxing experience, I decided that the cruise travel experience was not for me. The main reason being that I love to explore the local cuisine and culture of a country, and spend as much time as possible with the locals. On the cruise, I spent majority of my time on the ship with other travelers. We had organized games, shows, activities, casino, shopping, dining, etc., but I felt it was geared towards families and older crowds. I felt a little too sedentary. Being on Anthem of the Seas, a brand new ship by Royal Caribbean, has changed my perspective on cruising. This 2-weeks Mediterranean sailing took me to different ports across 5 countries – UK, Spain, Italy, France and Portugal. There were organized tours offered in each of the ports, from city tours to wine tastings, I got to know about the history, culture, nature and art of the areas, and I always had the option to walk around on your own. We visited some ports that I may not have been able to see otherwise – Gibraltar, Cartagena, Seville, Vigo, etc. Being on board offered a very different experience as well this time around. Anthem of the Seas is one of the biggest ships in the world, with 2,090 staterooms and a capacity of 6400 people (guests and crew). Given that, the cabin sizes are huge. I had a superior room with a balcony and sitting area, but there are also 2-storied lofts and 3 bedroom suites available. I never felt claustrophobic during my two week sail. Walking around the ship’s 18 decks can be quite fun. It took me a couple of days to get oriented, and realize where everything was. I admired every architectural detail, the beautiful artwork adorning the promenade, intricate flooring and ceiling work set to match the tunes of different areas of the ship, contemporary style of the rooms, themed music halls and theaters – this was by far the most beautiful ship I have ever seen. In my previous cruising experiences, there were only 1 or 2 options for dining – generally a formal sit down and a casual fast food place. On the Anthem, there are 30 eateries to choose from! 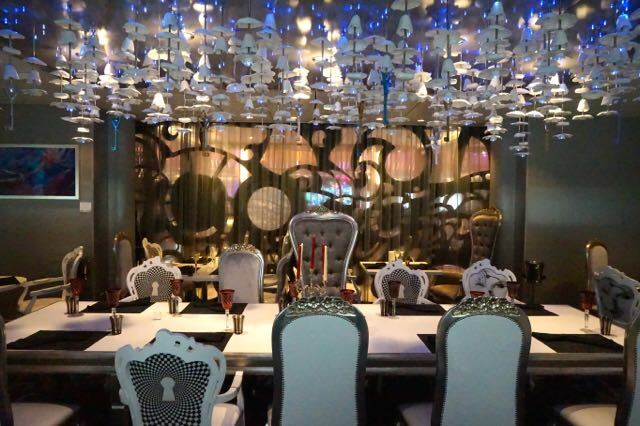 Themed restaurants include Japanese, Italian, French, Asian Pacific, American, British pub, cafes, buffet, and much more. Each one has a unique ambiance and creative cocktail menu. Just the design of the restaurants is worth checking out. The food is comparable to any upscale restaurant on land. Furthermore, you are not restricted to sitting at round banquet tables along with other guests you don’t know. Couples can easily have a date night, while families can reserve larger tables for privacy. Sure most cruise ships have a little gym and nice spa services. But on the Anthem, they take physical health seriously. There are fitness classes – yoga, stretch, pilates, spin, even a boot camp, for those who want to stay healthy. You can get a personal instructor who will train with you, a nutritionist to consult with, and several anti aging solutions. The activities on the Anthem are geared not only to families, but adventures as well. I typically won’t sit for a bingo, guess the tunes, or jeopardy kind of sessions. But here, I can go skydiving, go-carting, rock climbing, skating, surfing and be lifted 300 feet above sea level. Another fact I liked about Anthem is that you really don’t need to travel with your family or friends to enjoy this cruise vacation. On the daily calendar are scheduled lunch for singles on the ship and LGBT community mixers. Of course, there are tailored activities for teens, youth and couples too. There are several options to choose from for evening entertainment. At any given time, there is live music at 4-5 venues across the ship. Depending on my mood, I can sit at the piano bar, listen to 80’s rock, watch Broadway style performances, cabaret shows, or get up close with world renowned musicians. I view cruising in a different light now. A ship like Anthem of the Seas is not just for the older generation, but can be a lot of fun for younger travelers too. If this is what the new age of cruising looks like, I will definitely be considering this option for my future travels.